After the dignitaries finished their speeches, students at yesterday's ceremony to rename the former Wagar High School in Cote St. Luc were encouraged to make small talk over slices of kosher pizza. They were seated in the cafeteria of the newly christened Giovanni Palatucci Educational Centre - named in honour of an Italian police officer who saved the lives of thousands of Jews during the Second World War. 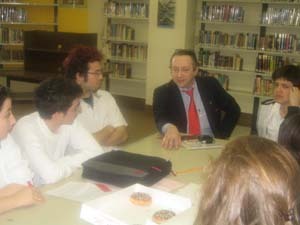 It was the third time the Grade 11 students, of Italian and Jewish heritages, had the opportunity to shoot the breeze. The students at yesterday's event were from Bialik High School, a private institution in Cote St. Luc, and Laurier Macdonald High School in St. Leonard. They're part of an initiative by the English Montreal School Board to "twin" schools with pupils from different cultural backgrounds. Before their first meeting this year, the Jewish kids from Bialik had never set foot in St. Leonard. The Italian youths from Laurier Macdonald were surprised that the tasty pizza served at yesterday's get-together was kosher. Laurier Macdonald students visited the Montreal Holocaust Memorial Centre this year; in turn, the Bialik students visited Laurier Macdonald. Students from both schools learned about Palatucci, who died in 1945 at the Dachau concentration camp after sending his Jewish fiancée to safety in Switzerland. It's the first time a Canadian public school has been named after a Holocaust hero. "Many of the students in our school system are Italian Catholics," EMSB commissioner Syd Wise noted. "So by selecting an Italian who saved Jews, it symbolizes our efforts to twin schools and bring students together." "You don't need millions of dollars to do these types of programs," EMSB spokesperson Michael Cohen said. "You just need to be creative." Still, such efforts can be expensive for cash-strapped boards. The costs of the twinning project were defrayed by private donors. Yesterday's ceremony featured speeches by Italian and Jewish community leaders, including Nino Colavecchio, president of the National Congress of Italian Canadians, and Beryl Wajsman, of the Institute for Public Affairs of Montreal. Retired Canadian general Lewis MacKenzie, who commanded ground troops during the conflict in the Balkans during the early 1990s, spoke about tolerance. What can I say. You and Lew made this event. Beryl, Congratulations ! Great presentation and very wise words to all were there. You are a true student of history(master) and speak very eloquently. MONTREAL, MAY 12, 2006 ­ Retired Canadian Major General Lewis MacKenzie, who has commanded ground troops in some of the world’s most dangerous places, will be the keynote speaker on Tuesday, May 16 ( 10 a.m.) at the ceremony to rename the former Wagar High School building in Côte Saint-Luc (5785 Parkhaven) after Italian Holocaust hero Giovanni Palatucci. Major General MacKenzie’s appearance was made possible by the Institute for Public Affairs of Montreal. 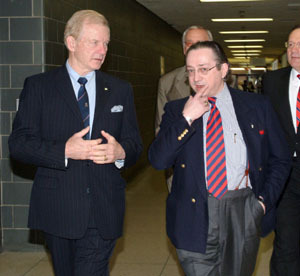 English Montreal School Board (EMSB) Chairman Dominic Spiridigliozzi and Commissioner Syd Wise, who have spearheaded this initiative, note that Major General MacKenzie is the precise person they wanted to attend this event and deliver the message to students that despite the fact the Holocaust ended more than 50 years ago we still witness today acts of genocide around the world. It was for this reason that the EMSB decided to become the first public school board in Canadian history to name a school building after someone who saved lives during the Holocaust. Rev. John Palatucci of New York City, a cousin of Giovanni Palatucci, will be present at the ceremony to address the gathering. Students from Laurier Macdonald and Bialik will attend the event as will students from John Grant High School and the Marymount Adult Education Centre. The latter two as the present-day occupants of the facility. The Bialik Choir will perform and a student just back from the March of the Living in Poland and Israel will introduce Maj. General Mackenzie. Other speakers will include National Congress of Italian Canadians President Nino Colavecchio and Beryl Wajsman President of the Institute for Public Affairs. This program was made possible via the sponsorship of Montreal Holocaust Memorial Centre Immediate Past President Jack Dym, Beryl Wajsman of the Institute for Public Affairs of Montreal, Dominic Spiridigliozzi, St.Léonard- St. Michel Member of Parliament Massimo Pacetti and a number of others. MONTREAL - Forty Grade 11 Bialik students took a bus across town from Cote St. Luc to St. Leonard to meet 40 of their counterparts at Laurier Macdonald, where the majority are Catholic and of Italian origin. 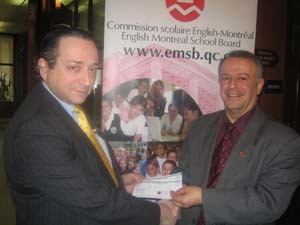 The exchange program was organized with the English Montreal School Board (EMSB) in connection with the official renaming the former Wagar High School in Cote St. Luc, which will be called the Giovanni Palatucci Educational Centre as of May 16. The 80 students will play a major part in the ceremony. Palatucci was a young Italian policeman credited with rescuing as many as 5,000 Jews from Nazi oppression. He died in the Dachau concentration camp in 1945. According to the EMSB’s research, this will be the first time in Canada that a public school building has been named after someone who saved lives during the Holocaust. Palatucci was recognized by Yad Vashem in 1990 as Righteous Among the Nations. The half-day at Laurier Macdonald began with all the students watching the premiere of Ripples in Time, a documentary film with dramatic re-enactments, made by the Laurier Macdonald students. It profiles the difficult circumstances that brought their grandparents or parents to Canada and their struggles to create new lives. One girl recounts how her Ukrainian grandparents were deported to a forced-labour camp in Germany during World War II. Another describes her grandfather, a reluctant Italian soldier, wounded on the Russian front. A third tells the story of her mother coming to Canada as a young child in the 1950s with a family escaping poverty in Naples, while a fourth looks at her grandfather’s escape from political violence in Lebanon after World War II. The message is the same: all were caught up in events beyond their control and worked hard to build a better life here, overcoming obstacles thanks to a determined spirit. It was a message the Bialik students could relate to. The students then broke up into groups of 10 with an adult facilitator and assigned to tables named for humanitarians as diverse as Oskar Schindler, Simon Wiesenthal, Mother Theresa and Nelson Mandela. Once the students overcame their initial shyness, the conversations veered off in many directions. At the table led by Beryl Wajsman, president of the Institute for Public Affairs of Montreal, one of the sponsors of the exchange program, students ended up deciding to start a petition against child labour in the Third World. Wajsman warned the kids against “getting stuck in their own little parochial ghettoes,” and urged them to open their eyes to injustice of all kinds. Laurier Macdonald’s Jamie Zakaib said visiting the Montreal Holocaust Memorial Centre museum had a “profound effect” on her, as did seeing the obvious pain expressed in the film by the Ukrainian grandmother of one of her classmates. “We have to learn from our mistakes and not repeat them,” Zakaib said. The Laurier Macdonald students were later invited to attend Bialik’s Yom Hashoah commemoration. The exchange receives funding from former Wagar student Jack Dym, the immediate past president of the Holocaust centre. B’nai Brith Canada is also involved, and its community relations director Leah Berger was one of the discussion facilitators. Thanks again for today. It was amazing to see you in action. You were outstanding. The students and staff from BOTH schools were impressed. I think we may have found an entire new mission for the Institute.